For years, I never caught on to the worn chambray shirt bandwagon because I never found one worth getting excited over. Recently, I have been bombarded by them when in stores, and finally caved under the pressure. To my surprise, I absolutely adore it and didn't know how I lived for so long without one. And to pair it with white jeans, bright sandals and a summer hat, seemed like a perfect way to break it in. An afternoon BBQ was just the occasion I was looking for to wear my proud new purchase, and this past Sunday I got that chance. My friends live on a beautiful tree lined street with statuesque brownstones that have such character, so we couldn't resist taking pictures in the neighborhood. 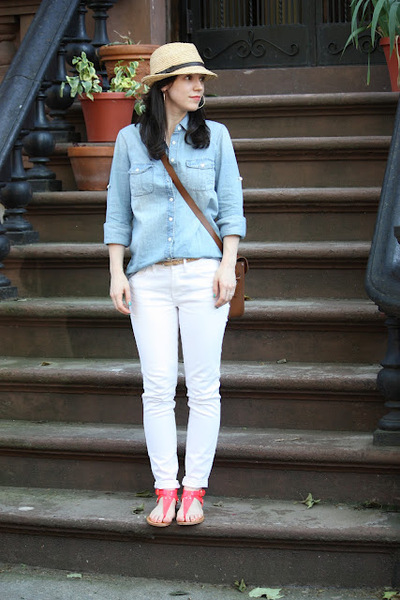 What other ways do you wear a chambray shirt? I would love to know and get some inspiration ideas for my next pairing with this piece. You look great. Hope all is well. Things are going well! How is the new job? Are you liking it?? This picture reminded me of the good old days back in the city. Love the hat. You look really good in this pic.